We at Los Banditos Mexican Restaurants invite you to feast on our wide array of Mexican selections. Over the years we have been voted "Best Mexican Restaurant," "Best Ethnic Restaurant," and "Best Margarita" in Green Bay in the Green Bay Press-Gazette and News Chronicle newspaper polls. As well as a listing in "The Very Best Restaurants and Where to Find Them" guide to the nations' top Mexican-dining establishments. This is your basic yet over priced Americanized Mexican food. I can see how the clientele that goes there would like the food. However, if you like real Mexican food, there are WAY better options in GB. Relaxing evening with great food. Service was professional. Free dessert for my birthday. That was nice. For lunch today, I decided to eat at Los Banditos, which is a restaurant that specializes in Mexican cuisine. It is located on the East side of Green Bay. The entrance is located in the back of the building in the parking lot. As you walk in, to the right, is a smaller dining room and to the left are a hostess stand and a large bar with booths and tables for added dining. Los Banditos is decorated in a Mexican theme. As for the atmosphere, the lighting is dim and soft rock music plays in the background. The hostess sat me in the bar dining area with a menu. It was not a busy lunch, besides me there was only one other table of two dining. I waited some time before my server came over. I noticed it was the same person who had been chatting with the other two diners and showing them something in a shopping bag. The server had a friendly manner and brought over a glass of ice water along with chips and salsa. I put in my order for a pork Chimichanga for $10.75. That comes with guacamole and sour cream. For the Chimichanga you also have a choice of beef, seafood or chicken.As I waited for my food, I noticed on a small board across the room a list of specials for that day. I was annoyed that my server never told me of the specials, why bother featuring any if you are not going to tell your customer. My chips were okay and the salsa tasted like hot pureed tomato sauce. Very unimaginative. My food came and looked appealing. Although, the guacamole had a grey color to it, so it was not fresh, but it had a good flavor. 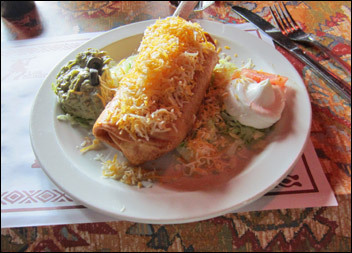 My Chimichanga was a large flour tortilla filled with large amounts of shredded pork while all being lightly fried. The pork was very tender with a mild flavor. During my lunch, my water glass was empty and I was never poured a refill. My server was too busy talking with the bartender, so I finally got up to ask for more water. They were so deep into their conversation it took me a couple times to get their attention. My server then comes over with a big smile and gives me a full carafe of ice water, but at that point I was finished with my meal. During my lunch only one more couple came in for lunch. It never became busy and the service was inexcusably lax and poor. Los Banditos also offers a few Italian entrees.